Freshly baked rolls are easy to make using a simple shortcut! 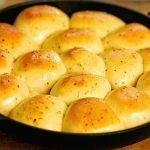 Tasty easy dinner rolls that are a perfect side dish at every meal! Using 1 tablespoon butter, generously butter the inside of a cast iron skillet. Place the frozen dinner rolls in the buttered skillet about 2 inches apart. Cover with plastic wrap and place in a warm area. Let rise until doubled in size, about three hours. Before baking melt the butter and stir in the remaining spices. Generously brush onto the uncooked rolls. Bake according to package directions until golden brown. When the rolls are removed from the oven, brush with the remaining butter. Serve while hot and enjoy!